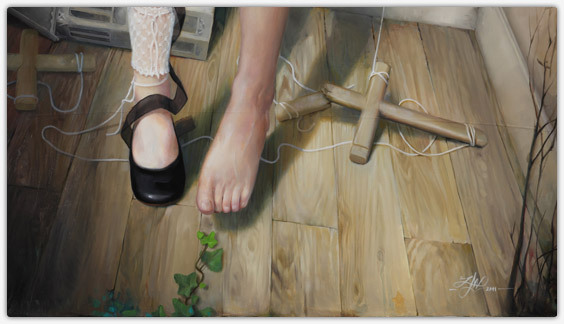 Bottom part of the painting "No Doll "
Every evening when twilight falls, I wonder: was it her smiling at me? Was it her, I whisper... when she, fragile and quiet, held her hand out and released the light soft and pale of a fragile moonbeam. And you've grown into a bright sunshine that rises up in the wide April sky, and I stand, blinded and vain, crouching in your shadow, wandering and alone, forever unable to deserve our dreams. But as long as some blue paint stains my fingers, it keeps me safe from an answer. After two silent years I will show up at the dear swiss convention Polymanga with miss Zelie Oiseau from the 25th to 28th of march. From April 18th to the 21st, a large exhibition of my oil paintings will be displayed as part of Polymanga 2014 in Montreux, Switzerland. There will be about 15 original canvases, many original drawings, and an innovative interactive installation that will let visitors "enter the paintings". I will be in Art to Play in Nantes, on November 24th and 25th, for a painting context and a stand where to showcase some works.